Following a mission led by the NCTTCA Secretariat to Malaba and Elegu/Nimule to evaluate the implementation of the Northern Corridor Council of Ministers’ resolution made in December 2013 “to support the Member States in strengthening/formation of Joint Border Committees (JBCs) and Cross Joint Border Committees”, it emerged that constraints in functioning of JBC’s still exist. These include communication gap between members of the Joint Border Committees and Policy makers, lack of lead agencies, composition of JBCs membership that leaves out the Private Sector representatives, lack of regular meetings, etc. Elegu/Nimule Cross Joint Border stakeholders’ workshop on strengthening the JBC’s along the Northern Corridor, 22nd September 2017. The rationale behind the institutionalisation of the JBCs was to formalize the multisector collaboration between the public and private sector stakeholders involved in the handling and clearance of goods at the border stations for the purpose of addressing operational challenges which may arise at the border stations. At some border stations, Joint Border Committees do exist. However, their performance needed to be evaluated and measures taken to strengthen them whereas at some borders there are no JBCs and they need to be formed. Furthermore, there is need for formation of Cross Joint Border Committees where the public and private sector stakeholders operating in the adjoining States come together to discuss issues affecting their operations. At the Kenya/Uganda border station of Malaba for example, each side has a Joint Border Committee. The JBCs at Malaba are chaired by Customs Authorities and expected to meet monthly. But it was observed that the meetings are not regularly held. Kenya has an institutional framework for formation of JBC’s but Uganda does not have one. After the formalization of the JBCs at the Kenya/Uganda Malaba border stations, members and stakeholders of the JBCs agreed that each side of the border will hold a JBC meeting on a monthly basis, the two JBCs to hold Cross Joint Border Committee meetings on a quarterly basis and minutes/reports to be shared with higher authorities and the Northern Corridor Transit and Transport Coordination Authority (NCTTCA) Secretariat. At the Uganda/South Sudan Elegu-Nimule Border Station, it was observed that the current focus of the Border Management Committees at either side of the border is security. The Private Sector is also not part of these Committees. Joint Border Management Committee meetings at Elegu are held monthly whereas the meetings at Nimule are held when the need arises. Elegu Joint Border Management Committee meets regularly and chaired by the Border Internal Security Officer. The Committee comprises of government agencies. 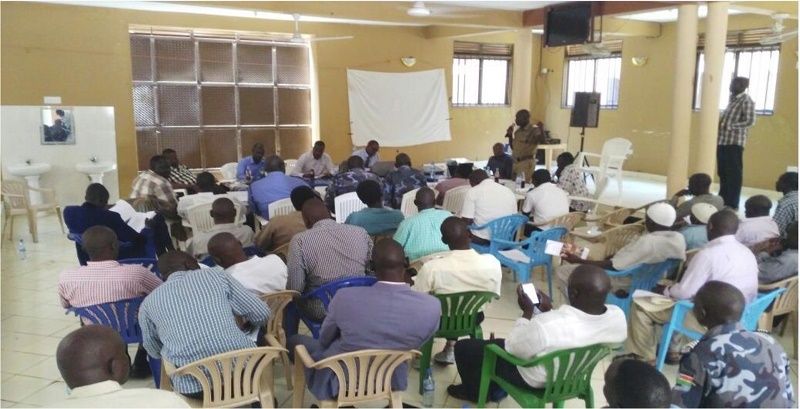 On the other hand Nimule also has and holds Border Management Meetings with membership drawn from Government agencies. During the workshop for stakeholders from South Sudan and Uganda held at Elegu to strengthen the functioning of Joint Border Committees it was agreed that Joint Border Management Committees at Elegu-Nimule formally evolve into Joint Border Committees as per the guidelines approved by the Northern Corridor Council of Ministers, the committees shall include the Private Sector and have working groups to address issues which are particularly for exclusive concern of the agencies such as security concerns. The two Joint Border Committees formed at either side of the border will form the Cross Joint Border Committee and will meet on a quarterly basis. The first meeting of the constituted Cross Joint Border Committee for Elegu/Nimule is expected to be held by the end of December 2017. In putting the operationalisation of the JBCs at another level, the Revenue Authorities will collaborate with NCTTCA Secretariat to come up with Key Performance indicators to be reported periodically and also a mechanism for exchange of data needed to generate the performance indicators.